Making your own herbed compound butter from fresh herbs in the garden allows you to season meats and vegetables on the grill or to enhance the flavor of vegetables at serving time. This herbed butter creates melt-in-your-mouth poultry dishes and can be served on crispy Italian bread or rolls. I'm often asked, "But how do I know which herbs to use?" The simple answer is: use the herbs that you prefer. My personal favorites are lemon thyme, oregano, basil, sage, rosemary and chives, but you may prefer others. Gather your favorite herbs in the early morning when they are fresh and have not suffered the effects of summer heat. Flavor is at its peak just before blooming begins, but herbs can be harvested and used at any time. Wash the herbs in cold water to remove garden soil or insect residue and pat them dry with a paper towel. Mince the herbs. For those with woody stems, strip the leaves and discard the stem before chopping. Soften two sticks of butter (or margarine) in a bowl with a fork. For lighter herbed butter you may wish to whip the butter with a mixer or whisk before adding the herbs. Add 2 to 4 tablespoons of your favorite herbs to the butter. I typically add a clove of minced garlic or grated Parmesan cheese, particularly if I intend to use herbed butter for breads or pasta. Blend the herbs into the butter with a fork. Spoon the mixture into a butter tub or similar container and store in the refrigerator. 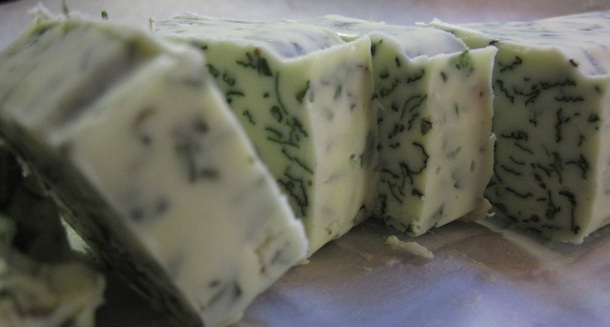 To create patties of herbed butter, spread the mixture onto a piece of plastic wrap and roll into a log approximately the size of a stick of butter. Place it in the refrigerator to chill until it is firm. Cut the roll into ¼ inch slices for individual servings of herbed butter. Use herbed compound butter to season grilled vegetables and meats, as an alternative to traditional garlic butter for garlic bread, served on hot pasta or baked potatoes or even too add flavor to stews of sauces. Don't be afraid to experiment to find the combination you prefer. You will be amazed with the flavor combinations that you may discover while adding your secret ingredient to recipes.